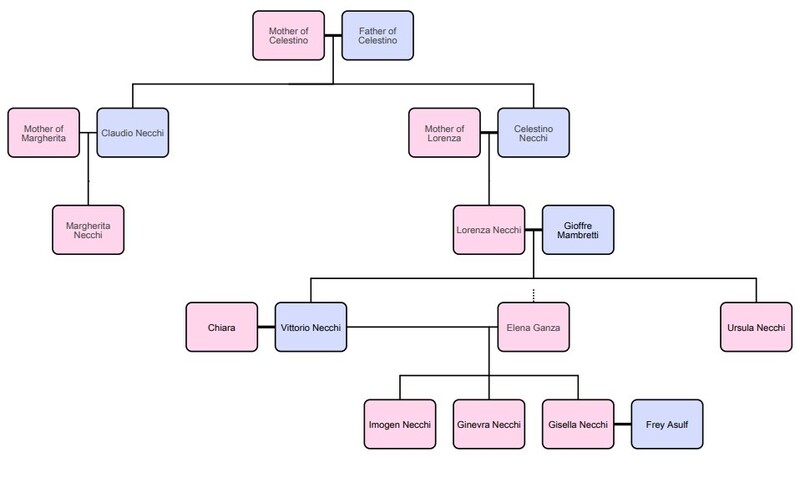 1271: Birth of Signora Margherita Giovanna di Necchi, heir to the house. 1272: Birth of Signora Lorenza Giuseppina di Necchi. 1276: Contessa Margherita Giovanna di Necchi inherits at just five when her father Conte Claudio dies in a shipwreck. A twenty-year regency begins under her uncle Signore Celestino. 1284: Contessa Margherita is betrothed to Signore Gioffre di Mambretti, of a sworn barony family. 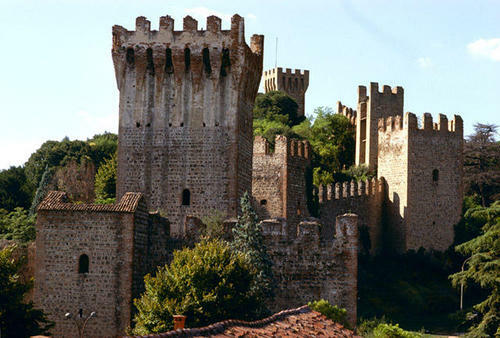 1290: The betrothal of Margherita and Gioffre is broken in favour of a politically stronger match in Avicorse. He is betrothed to the Contessa's cousin, Signora Lorenza. 1292: Wedding of Signora Lorenza di Necchi to Gioffre di Mambretti. 1293: Signore Vittorio is born. 1296: The regency of Contessa Margherita ends. She marries a highborn man of southern Avicorse. 1298: Death of Signore Celestino di Necchi. 1300: Contessa Margherita Giovanna di Necchi dies after taking ill at a feast aged 29 and childless. Her cousin Lorenza unexpectedly ascends to being Contessa di Necchi. 1313: Signore Vittorio di Necchi marries Signora Elena di Ganza. 1315: Birth of twins, Imogen and Ginevra, to Vittorio and Elena. 1317: The Necchis fight on the side of the Divine Empire in the Battle of Crocina. A young Signore Vittorio establishes himself in this year. 1322: Contessa Lorenza di Necchi dies of consumption at age 50. Her eldest son Signore Vittorio becomes Conte Vittorio di Necchi. 1330: In the escalating conflicts leading to the Battle of Cortaccia, the House di Necchi chooses to remain neutral fearing Matora to be victorious and them being traitors for choosing the Divine Empire as Caraligio. Of course, they just claim a year of bad harvest for not participating, even if the crops seem as plentiful as ever. 1333: Contessa Elena Ganza di Necchi, consort to Conte Vittorio, dies of a winter chill. The main family goes into mourning for a year and a half in their estates. 1335: Conte Vittorio marries his second wife, Signora Chiara. Saving from the isles owned by the Farros, the Necchi lands serve as the inland empire of Matora: the breadbasket of the realm, their lands are rich in grain and crops, and vineyards providing some of the city's finest wine! Traditional to an extent, they have the fewest female knights out of any houses and they often live up to the fantasies of martial men and ladies in lace: not that this stops a few members of the house from going their own way, now and then — and of course they sport the same equality on paper as the rest of the houses. 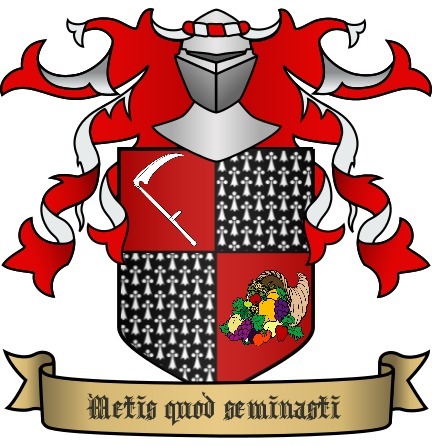 A typical trait associated with the Necchis is a certain pride and honour more akin to lands outside of the Bergatino City-States (probably because of their share in the traditional income of land wealth more than commerce and trade), and that pride tends to manifest itself as either haughtiness or simply knowing the flowery courtesies expected of nobles! The Conte di Necchi, Vittorio Celestino, has recently come out of mourning his late wife away from the city in his estates and working to re-establish a household with family, servants, sponsored craftsmen and servants alike. Children of Vittorio: Two possible between Imogen (21), Ginevra (21) and Gisella (18). You can come with a spouse, too! Siblings of Vittorio: Great if you want to play characters that are a bit older. His next oldest sibling, Ursula, would have been managing his estates in Matora for the past year and a half when he was in mourning. Also, you could make siblings as young as 23 considering that Vittorio's mother had him at 21 and could have still had kids up to around 40 or so! Nieces/nephews of Vittorio: Just make sure that it makes sense that you can be 18 and that your parent would have had you at at least 18! Cousins of Vittorio: Even aunts and uncles for those that want to play characters a bit older! Vittorio's father, the old widowed Conte by marriage, might be possible too! Spouses: Vittorio is searching for a second wife alongside a consort for his daughter Imogen and to marry off (or have others marry in) his other kids! Household members! Ladies-in-waiting and gentleman companions (would usually be upper-class themselves! ), sworn knights, warriors and guards, stewards and agronomists, tutors, seneschals and spymasters, handmaids and manservants. Tag your character page with the 'necchi' tag to have your character icon show here.